Trinity Mirror North West "McCartneys: In the Town Where They Were Born"
Главная / Мр.Поустман / Форум Lost Lennon Tapes / Trinity Mirror North West "McCartneys: In the Town Where They Were Born"
Paperback: 96 pages Publisher: Trinity Mirror North West and North Wales (October 20, 2009) Language: English ISBN-10: 1906802378 ISBN-13: 978-1906802370 The Beatles legend is one of the world's biggest stars, his timeless music still selling across the world as he continues to appeal to thousands of adoring fans across different generations. This book, for the first time, goes back to McCartney's roots, unveiling the secrets of his childhood and early life in Liverpool. With new research by Kevin Roach, some fascinating facts are revealed for the first time as the author takes fans back to where he once belonged. From McCartney's childhood home to the church where his mother and father were married and other stopping points of family interest, this book digs deeper than any other has previously done, telling the untold story of life before the Fab Four took the pop world by storm. It is a magical history tour waiting to take you away - and a must for Macca fans everywhere. 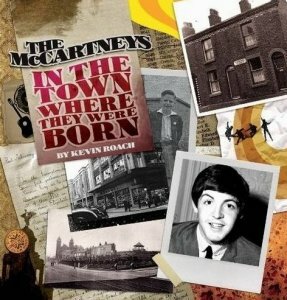 Обсуждение анонса: "Trinity Mirror North West "McCartneys: In the Town Where They Were Born""
"The McCartneys: In the Town Where They Were Born" by Kevin Roach (available from Amazon.com and Amazon.co.uk) is a charming look at the history of Paul McCartney and his family's past. The 112 page book begins with Paul McCartney's school days. Page 10 features a photo of Paul with his school mates in the Anglican Church in 1952. But the book goes back further than that recalling his grandparents, Joe and Florrie, with a picture of the Christ Church in Kensington where they were married. A legal journal with their marriage listing is pictured. It's this type of detail that makes the book so enjoyable. Past residences of family members are pictured. The book also has a detailed history of Paul's mother, Mary, whose maiden name was Mohin. It shows the building where Jim McCartney, Paul's father, and Mary met, along with St. Swithin's Church in Gillmoss, where they were married. And, of course, it including the residences they lived in, among them Forthlin Road where Paul spent his childhood. Paul's own story begins in Chapter 4. His baptism listing (his name is listed in Latin as Jacobus Paulus McCartney) and a picture of Walton Hospital, where he was born, is included. Page 72 features the Coronation Day essay written by Paul in 1953. (We previously wrote about it here.) A school register showing his name is pictured. (Two names above his is Quarryman John Duff Lowe.) Michael McCartney's story is included, too. The book even has text of the obituaries for Paul's mother and father. Finally, it includes some recent pictures, including Paul's 2008 performance at Anfield in Liverpool. It's a charming book that McCartney fans will want to have on their shelves. Обсуждение анонса: "Обсуждение новости: "Trinity Mirror North West "McCartneys: In the Town Where They Were Born"""